Off (override): This option turns off the app for the OU, overriding the ON/OFF setting made at the parent organization level. Inherit: This option uses the ON/OFF setting designated at the OU’s parent organization level. 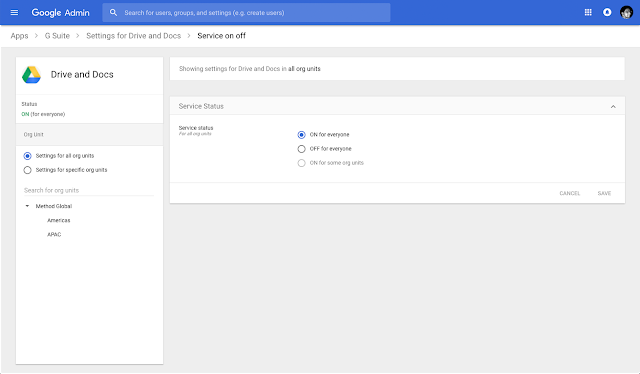 Alternatively, if you click into the details page of a specific app and go to adjust the ON/OFF setting to “On for some organizations,” you’ll see a new page layout that shows the service status with the option to change the setting. From there, you can easily click in the top left of the screen to navigate back to any of the previous pages in the Admin console. Controlling the settings for your domain, and the organizational units (OUs) within it, is a critical part of being a G Suite admin. We’re now making that easier with changes to the apps settings list page in the Admin console. 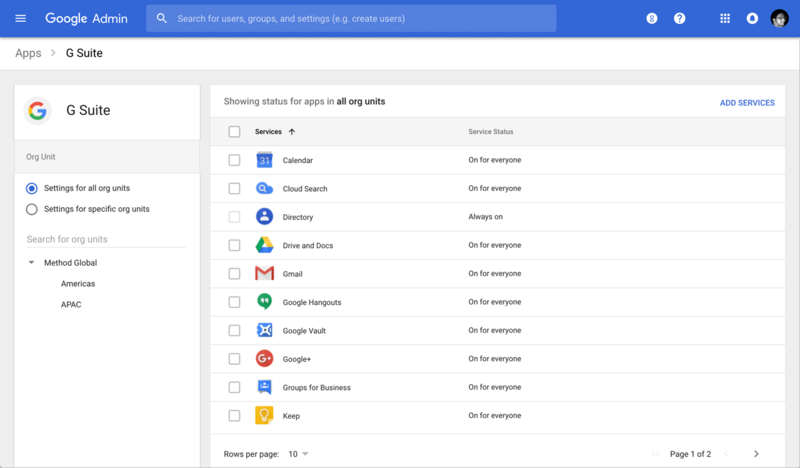 Navigating to Apps > G Suite will now list out your domain’s available G Suite core apps with a cleaner look and feel. Also on this page you’ll see a new panel on the left-hand side where you can toggle between app management at the domain or OU level.